There is a thread for favourite Phantoms, but not for favourite Christines. So I thought I'd make one. Simple rules: DO NOT offend any actress or any user that has a different view. Tell your FAVOURITE Christines, not your LEAST FAVOURITES. Say no XY is better than YX-things. Explain why you like your favourites. Write nothing like "XY IS THE BEST EVER!!!111!!!1!" or "YX SUCKZ!!!11!!1!" WHat makes me like a Christine actress? I think it's the small tightrope between an opera singer and an angelic voice. I don't like too operatic dramatical deep Christines. But Disney princesses that would never be able to sing real opera are simply unrealistic, since Christine IS an opera singer. I love clear, sweet bell like voices. Light lyrical or coloratura sopranos or very strong soubrettes. Dramatical sopranos or Mezzos sound strange as Christines, in my opinion. Sarah Brightman is the favourite of many people, while many other people dislike her. I understand both. Sarah isn't a very strong singer or actress. But I always liked her and she was a very fitting Christine. And I think her voice back then had a very lovely tune and her over-acting wasn't really her fault (she had to it...). I like her as a singer and I know she has lost her voice (kind of). I like her. But I know she isn't all that strong. Still, there would be no PotO if not for her. So Sarah gets kind of a special ranking, she won't be included into my favourite list. My favourite Christine is Anna O'Byrne. 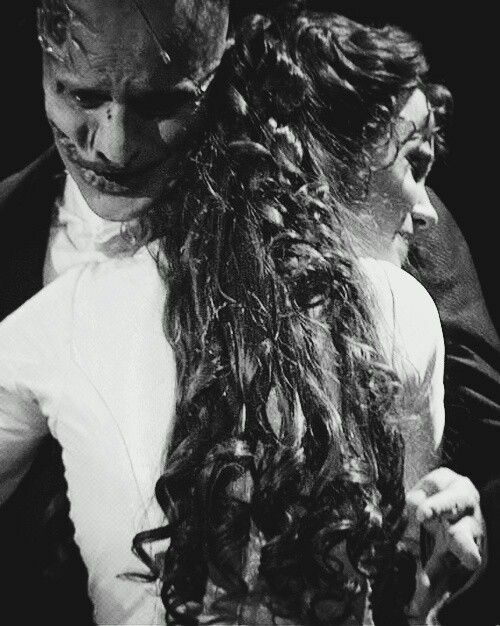 Both in PotO and in LND. Her voice is clear and sweet, but also strong and she is able to sing real opera. Her acting is an intelligent Christine and I like that and well, she simply fits my personal taste. Her voice is what I always imagined Christine to sound like and - even though it is unnecessary - I like the way she looks. Not like "OMG she's so pretty", but like "That is what Christine looks like. Very fitting." I am really in love with Claire Moore. She had a hard job alternating for Sarah in the OLC, especially in the beginning. And she has a very lovely voice, like a way stronger version of Sarah's. Very sweet and very strong, operatic enough but not TOO much. I feel the same about Claire Lyon. Her voice ist very beautiful! It's simply my personal taste. Sierra Boggess gets a lot of love, doesn't she? Well, she deserves it! She is such a strong singer AND actresses and such a lovely person! Luzia Nistler of the OVC was also a very lovely Christine. I love everything about the OVC, Luzia is not my favourite cast member, but she is lovely, anyways. QUite operatic, but still pleasant and her "Twisted Every Way" (Hier steh ich allein) is really lovely. But her "R"s annoy me. Verrrrrrry much. I'd also like to mention Ana Marina, Samantha Hill and Julie Hanson. All of them very lovely. Please excuse grammar and spelling mistakes. My English isn't very good. I agree with you completely! Though, in my opinion, Sarah Brightman isn't the strongest Christine, she was the first, and I have tons of respect for her because of that. Sierra Boggess is gorgeous and has a beautiful voice (I love it when she sings "The tears I might have shed for your dark fate, grow cold and turn to tears of hate") but I think she has an advantage over many other Christines. Since her performance (25th anniversary Royal Albert Hall) can be purchased and watched at home, many people are familiar with her and not with the other very talented Christine actresses, so she's more famous. I really love Anne O'Byrne because of her voice. Like you said, it's clear and strong which is very "Christine-like" Though I imagine Christine to look more like Emmy Rossum, (I don't think Emmy's a strong singer or actress, but she looks like Christine) Anne O'Byrne has that innocent quality that makes her a wonderful Christine. As for Emmy: No, I don't imagine Christine to look like her. OK, I imagine her BLONDE and I imagine her with an old-fashioned face and intelligent expressions. Emmy is pretty, but her face is modern and she always looks like... umm... the lights are off, you know? Well that makes sense because Christine is blonde in the book, I believe. I didn't want to offend Emmy, but I also think she's too young. Christine is an adult young woman who has already finished college. , but I also think she's too young. Christine is an adult young woman who has already finished college. There are quite a few Christines I really like. For now, I think my favourite would be Kristen Hertzenberg, who was the alternate Christine in the Las Vegas production from 2007 until it closed in 2012. I really loved her voice and acting when I saw the show live, especially how close her acting was to Leroux's description of Christine. She was really wonderful in person after the show, as well... I really wish she was still playing the role somewhere, but I respect that she likes living in Las Vegas and her family's getting along well there, so she doesn't want to join the Broadway or touring versions at this point. Maybe sometime in the future, she can rejoin POTO somewhere. Another favourite of mine is Elisabeth Berg, who was featured on the original Swedish cast recording. She had a marvelous, clear operatic voice and seemed to do well acting-wise, as well (though I'd really love to find a video of her in the role). The whole original Swedish cast was fantastic, I thought. I also loved Joke de Kruijf, who was on the original Netherlands cast album and also played the role in Vienna. Again, very clear operatic voice, and I think she was a great actress in the role. It was neat to find more recent videos of her singing "Think of Me" in Dutch -- she's still got it, even years later. I agree with those who posted earlier about Sierra Boggess... I thought she was okay in Las Vegas, but fantastic in the London concert and her recent Broadway run. Looking forward to seeing her opposite Norm Lewis! My favorite is Sarah Brightman. She is the most classically trained singer, and the most operatic sounding of the actresses I've heard. Her concert repertoire often includes operatic selections. I've also really enjoyed Sierra Boggess' take on Christine. Both her acting and her vocals are great. Rebecca Luker was wonderful in this role. What a great vocal tone. I like it when whoever is playing Christine actually tries to act the part and discover her character. I think that is what was one of the major things wrong with the movie version. Emmy Rossum is very pretty and has a nice voice, but she never quite "got" the character, and she was so young and (I think) nervous that she often held back on her vocals. It would be interesting to see how she would play Christine now after having had more experience in show business. Sarah Brightman is clearly one of my faves and I have lots of respect of her being the first Christine, but... She is clearly not the most classically trained singer. She had her first real vocal lessons in her early twenties and began her classical training years later. And she doesn't sound operatic at all. Maybe a little bit, but not very much.There are lots of more operatic Christines, even though I have to admit, that I am usually not that fond of them. Just as I am not fond of pop-ish Christines. I prefer something in the middle - liek Sarah. but my favourites will stay Anna O'Byrne, Claire Moore and Claire Lyon.